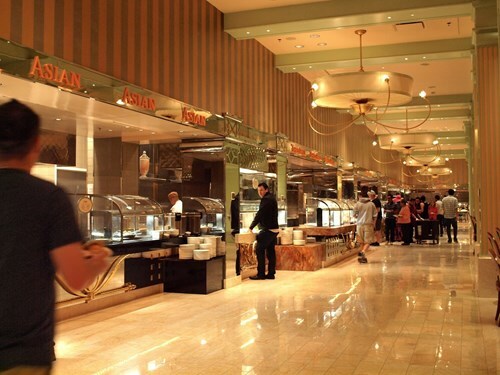 The The Buffet is a restaurant inside Harrah's Las Vegas Casino & Hotel in Las Vegas, Nevada. The decor and ambiance is what makes this a 4 Star buffet to me. We went for brunch. The dessert table is set up beautifully, but I didn’t feel that there were many options to choose from. I didn’t even get any dessert because I didn’t find anything I wanted to try. The food itself was decent. Not many options there either. But I will say, THE PANCAKES WERE AMAZING. Best pancakes I’ve ever had. And I went back for seconds. I would come back to this buffet only to get the pancakes again. Maybe the dinner buffet is better? I’m not sure. But there are other Vegas buffets with much more food options to choose from. Amazing!!! The food here was incredible. High quality, each bite bursting with flavor. The new York strip was the best I've ever had. I've eaten all around the world this is hard to beat. The price was spot on. The service was incredible. I will be going back no doubt about it! The restaurant is beautiful! The hot food is acceptable. The deserts are delicious. The green tea ice cream is delicious. The cheesecake is delicious. The service is good. We went there at 1:30 pm. We waited in line about 20 minutes. We don’t like sushi bar. There was no seafood bar at lunch. Everything 5 stars from decor to service except food 4 stars! Nice decor throughout the restaurant, nice food presentation, variety of food, dessert table is very presentable, great service & clean bathroom! We saw the review and planned to tryout on our first day! We went to restaurants at 3:00 p.m. and found out the dinner started at 3:30 p.m., we felt so lucky to pay the price for lunch but enjoy dinner the same time! Food I gave 4 stars because they look better than they tasted! And also because we had 2 more dinner at the same buffet and found out food not kept in standard level! Someday prime ribs is good and the other day it's so dry! Oysters not so fresh look very cloudy! Ice cream table looks great but doesn't taste good! I ordered mint chocolate ice-cream not very minty, instead most of the ice-cream taste very milky! Overall I gave 4 stars it's because it should be a 5 stars quality at Wynn's and the price! If it compares to other buffet, it will get 4+ . We join the Wynn casino red card for new players you earn certain points you can redeem 2 people or 4 people buffet, so we end up came back 2 more times for dinner! If you have time and not a member yet, you can try your luck before you head to the buffet, you might get them free! Beautiful decor. Friendly staff. Seafood isn't the best. Asian food isn't authentic. Sushi is bad. Meats are good. Desserts were very good. Overall, not worth $50 value and i don't mind spending on food or drinks. Overheated. We went to the buffet for lunch. It was a great price for two people for a buffet with such a good selection of quality food. Nice variety of different types of cuisines. I was honestly hoping for a slightly larger buffet - especially in the dessert section. But the food they did have was absolutely delicious. Would definitely go again for dinner or breakfast to check out that selection. I read so many websites that said brunch at The Wynn was the best. So when I finally planned my trip to Vegas this was the first place I wanted to go. All the food looked amazing, and the flowers looked beautiful, but the food was terrible! Tasted old and unseasoned. Just like every buffet I've ever been to. So disappointing. The only good items were the desserts mostly. This buffet is worth every penny. We have been here several times over the years and it’s better an better. Food is always good and in two to three bite size portions which make it awesome. The beef ribs are amazing. I don’t eat seafood but I am told it’s very good full crab legs sushi and more. I little salads are refreshing. The desert set up is positively the best I have ever seen on a buffet. Candied Apples, Cream Brûlée you name it. Came here for brunch buffet and it was amazing. From French toast to eggs Benedict and made to order omelettes. My number 1 was the regular eggs Benedict. They also had a crab eggs Benedict, that I didn't get to try. Omelette was very good too. You get to add mushrooms, peppers, etc to your omelette and it's so warm. It was a brunch heaven.